It’s year 2127, do you still possess a sense of smell? A secret lab in the future, where smell translators come together to translate smells into our other senses. Imagine a world in the not-so-distant future that has become optimized to be safe with virtually no crime, where every human is artificially grown to perfection and food has become highly nutritious and designed for the needs of each individual, consumed in the form of a pill once a day. In this world, there is no need for the sense of smell and thus our smelling abilities have been genetically engineered to not exist. However, it has become noticeable that people have become joy-less, feelings of enjoyment, connection, beauty and emotion have disappeared and most worrisome, rates of suicide have increased. Yet, there is hope. There are a few people who through a genetic mutation have retained their ability to smell, those in possession of the gene family Smell-X. Special agents search the world to identify these rare individuals who can perceive through their noses to be a “smell translator”. They are invited to a competition to translate basic smells into shapes. This is the first step to bringing humanity back into balance- giving them the ability to experience the elusive and emotive sense of smell through one of their other senses. Smell-X is is based on real research transposed onto a fictional storyline. Our senses send information to our brain to help us understand and perceive the world around us. Yet with the amount of sensory inputs we are constantly bombarded with how does our brain know which stimuli to combine to make sense of the world? For many years cognitive psychologists, neuroscientists, and developmental researchers have proven that our brains across geography, culture, language and age, associate certain sensory inputs with specific others across our senses – this they call a crossmodal correspondence. For example we tend to associate certain auditory pitch with visual size, colors with flavors and sounds with shapes. A German psychologist Wolfgang Kohler demonstrated in an experiment in 1929 that when he asked participants to match the sounds of “bouba” and “kiki” to two visual shapes, there was a strong preference for “bouba” to be associated with a curvy, rounded shape, and for “kiki” to be paired with a sharp, angular one. These same results have now been demonstrated in a wide variety of cultures. Fast-forward to almost a century later to the Crossmodal Lab at Oxford University, where Professor Charles Spence studies the psychological and neurological integration of information across our five senses. In this particular research he used 20 scents from the “Nez du Vin Aroma kit” and asked participants in his study to smell a scent and rate it on a series of dimensions. 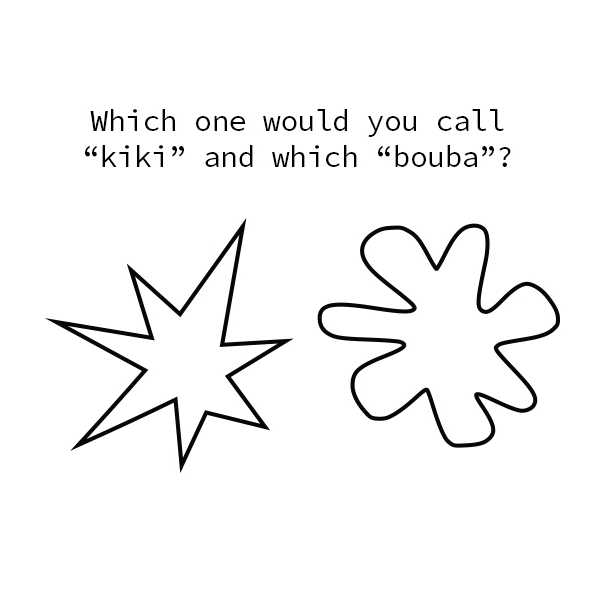 This included the dimension of rating the shapes “kiki” and “bouba” on a scale as seen in the figure to the right. He discovered that there are correlations between shapes and specific scents. In his study lemon and pepper were associated with angular shapes, while raspberry and vanilla were associated with rounded shapes Read more here. What if we asked people to freely create using scented material and these smell-shape correlations would still emerge? At the SCHI Lab at University of Sussex with Marianna Obrist’s team of engineers, psychologists, and a neuroscientist, we did just that. We gave participants three separate creative tasks of drawing, coloring and modeling. The only catch was that the modeling task was with scented modeling clay, scented with either vanilla, lemon or unscented. No one was told that the modeling material was scented, nor were they aware of crossmodal correspondences between scent and shape. 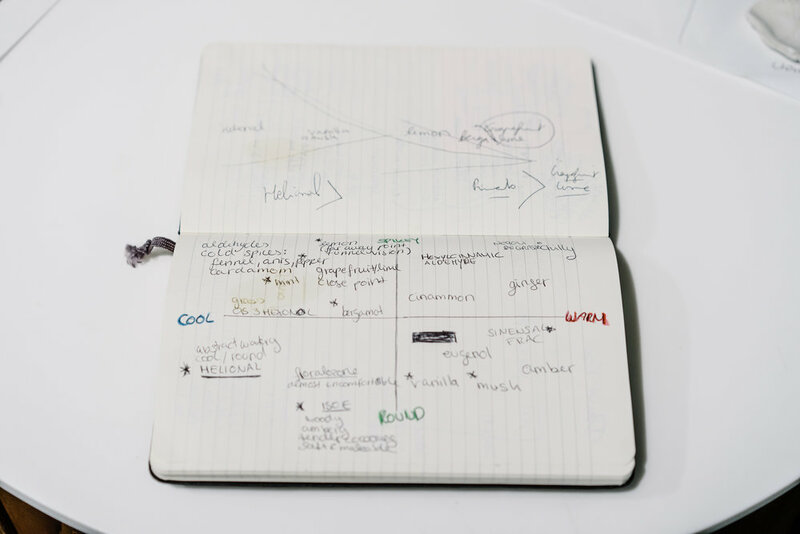 The goal was to see whether the different odors would lead to clearly identifiable differences in creative output. Turns out that through our analysis, it did. And people who used vanilla modeling material for their creative task, modeled denser more rounded objects whereas people who modeled with lemon scented clay modeled spikier and fragmented objects. This study was published as late breaking work at Human Computer Interaction Conference, CHI’16 and is used as a basis for the core of the experience “Smell-X”. The shapes on the left These are actual shapes from experiment at SCHI Lab, 2016. Read more here. Translating an academic study into a crossmodal interaction. The mission was to make science accessible and fun. I was asked to bring my academic research published at CHI on smell and shape to life in a public installation. WHAT?! Think about it, research is usually conducted in a sterile environment to eliminate interference and yet here, it would happen in a public festival. I spoke to various experts on experience design, performance and actors and started to brainstorm how this research could be transformed into an experience that would generate excitement, be educational and bring me more useful data. Through endless sketches and utilizing different experience frameworks, I soon realized that I should use "smell" as a novelty and way to attract people to this real life experience. In which case smell had to be a conscious element of the experience versus the subconscious one in my study when participants did not know they exposed to a scent while modeling a shape. This completely alters the core activity of modeling and smelling and required me to prototype it. This led to the first prototype at NYSCI where Ugo and I dropped four drops of either a vanilla or a lemon scent from the Dreamair Nyc Lab onto a cotton ball in a glass jar and asked participants to first smell the scent and then model whatever they wished. 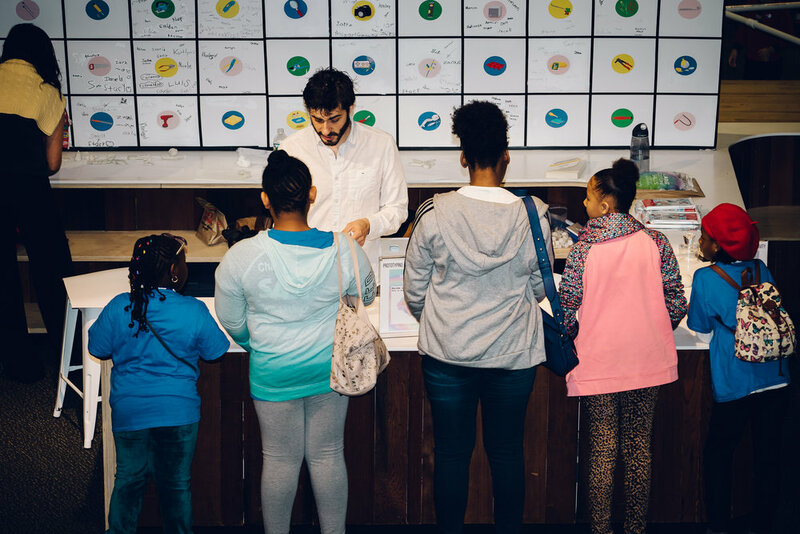 At New York Science Hall we tested vanilla and lemon scent for the modeling activity. We had about 60 participants ages 3-12 in addition to some adults. When participants smelled literal "vanilla" and "lemon" smells and were asked to model their shapes, the outcome was not the same as in an academic study where they were not told and not aware of scents being present during the modeling activity. Participants in this case modeled lemons when they smelled the lemon scent and flowers, ice cream cones and cotton candy when they smelled the vanilla scent. 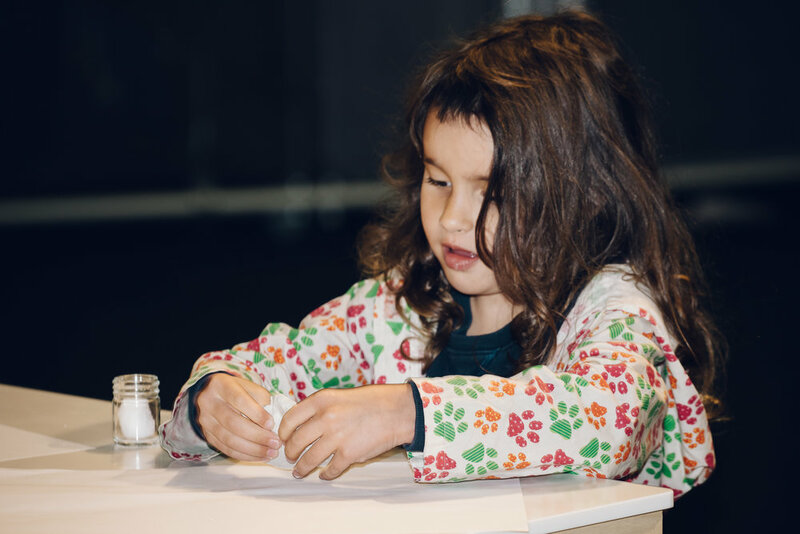 When parents interacted with their children in the activity, they always asked the child to think of what the smell reminded them of before modeling. This made the child focus on identification of the smell and literal translation versus free association of the smell. The scent was being processed through the rational mind, rather than allowing participants to model freely. The approach would have to be different if we wanted people to create intuitively after smelling a scent. Back in the Dreamair Nyc Lab, Ugo and I studied spikey and round raw materials and plotted them on an axis to also evaluate their "spikeyness", "roundness" and "temperature". Ugo then designed two fragrances to represent the shapes we wanted people to intuitively see: one round and the other spikey. A cold sharp vertical accord with lemon, aldehydes, sichuan pepper with lemony undertones and pink pepper, cold spices and incense. An enveloping round and dense accord, creamy comfortable powdery musky with a slight laconic effect between coconut and vanilla with a hint of violet petals. At the Rye YMCA. 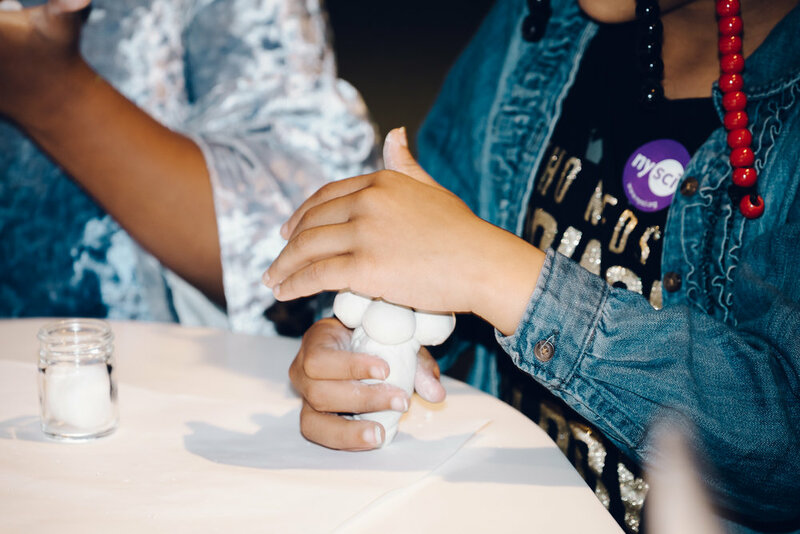 We had about 15 participants ages 3-11 to test the new spikey and round scents designed by Ugo. It worked! Ugo's abstract scents that were designed to represent spikey and round shapes, allowed participants to not focus on the single ingredients of "vanilla" and "lemon". 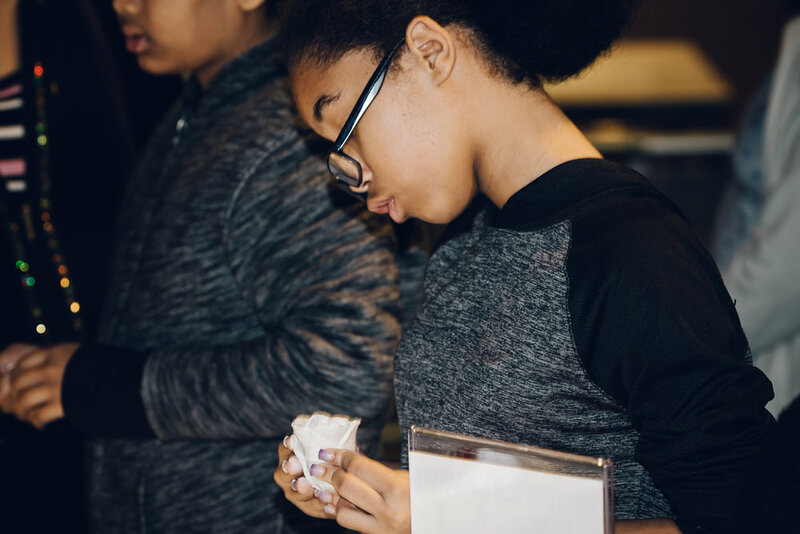 The new scents allowed participants to circumvent their rational analytical mind that would focus on identifying the ingredients, and connected intuitively with the smell of the shapes. Participants therefore modeled a shape that represented what they smelled. The instruction was always to smell and then to "model whatever you wish". 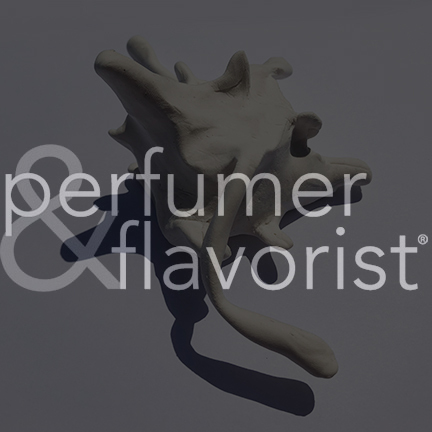 Olivia Jezler is a designer and scent strategist. As founder of FUTURE OF SMELL, Olivia helps brands and new technologies work together to succeed in today’s competitive marketplace. Through design-led innovation methods and bridging science, art and innovation, she provides foresight, brand development, sensory storytelling and strategic partnerships for transformation and growth. With a perspective from inside fragrance houses including IFF, Symrise and Robertet, working brand side on a corporate rebranding of Brazilian Multinational Natura Cosmetics with Pentagram London, to academic research in Human Computer Interaction at the SCHI LAB at University of Sussex, U.K, Olivia has developed evidence and data backed olfactive strategies for numerous brands from fine fragrance to FMCG and new technology products around the world. Olivia is a Brazilian, Thai and Swiss citizen with a degree in Design Strategy from Parsons School of Design in NYC. Ugo Charron is a native from wine-country Sancerre. Artistically influenced by his parents, he has been playing piano and guitar to express his feelings. Curious about everything, he embarks a scientific career to better understand his surrounding world. Lover of mixing, he naturally chooses the art of chemistry to became an ITECH formulation engineer (Lyon, 2015) where he first experiments perfume creation in Grasse. Since then, it has triggered his will to become a perfumer. He deepens his knowledge in perfumes thanks to the collaboration between L’Oréal’s Perfume Development Team (Paris, 2016) and Master ICAP specialised in perfumes and flavours (Montpellier, 2016). Recently, he has worked alongside Master Perfumer Christophe Laudamiel as a trainee perfumer between New-York and Berlin at Dreamair. He also loves to collaborate with artists to add an olfactory dimension to their work. Thank you Dreamair and Guerilla Science for your support. Thank you Perfumer & Flavorist and NEZ La Revue for covering the experience! Click on images below to read more. Follow me for smell insights and inspiration!